There is a common misconception among novice anglers that the reel isn’t all that significant to bagging a catch. This is because most people believe that the only role that the reel plays is to store the fly line. Well, this is simply not true. In my experience, it is this – the best fly reels will determine whether or not you catch the monster fish of your dreams. When trying to tire out a large or energetic fish, it is your reel that is going to help you out the most. 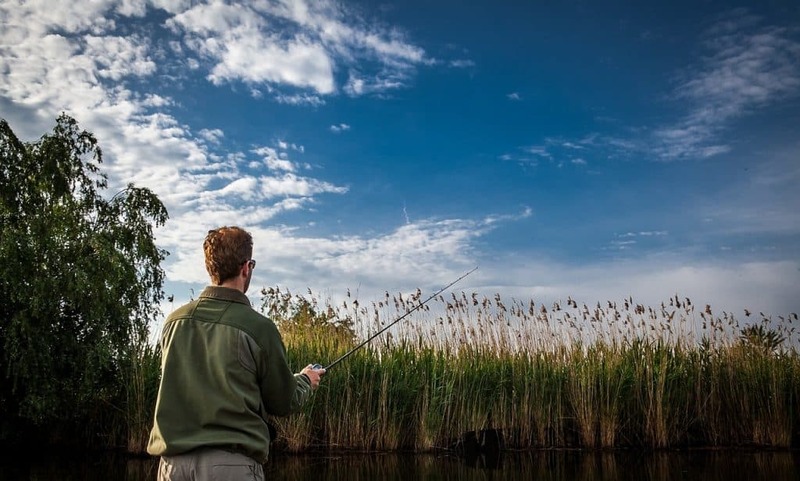 With this mind, let’s take a look at some of the things you need to know about fly fishing reels. What you may not realize is that there is quite a selection of fly reels available. They differ in size, quality, as well as performance. Now, in some instances, getting the best reel can mean spending more money. However, if you look more carefully at the various elements of the reels, you may not have to part with as much money. Therefore, the key to choosing the right reel is understanding the different parts and how they contribute to the overall operation of the reel. What Rod Are You Using? 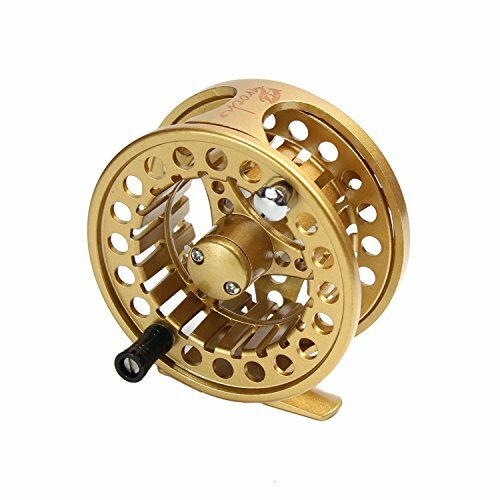 As you can imagine, the fly reel needs to be compatible with the fly fishing rod that you are using. This is particularly important in the case of the weight and size of the reel as it relates to the balance of the entire system. So, the first thing that you will need to figure out is the weight of the rod. This is typically based on the type of waters that you will be fishing in as well as the species of fish you are trying to catch. So, if you have a 7-weight rod, you will simply require a 7-weight reel. 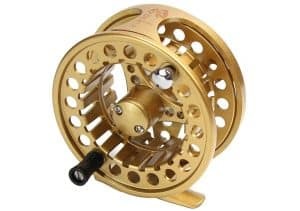 It can be argued that one of the more important aspects of a fly fishing reel is the drag. Click and Pawl – This is commonly found in standard arbor designs. The method used in this system is quite simple and relies on a varying amount of pressure on the spindle. Now, this system isn’t all that adjustable and has minimal drag. As such, it really is only suitable for smaller fish. Disc Drag – The disc drag, however, is a lot more efficient. This is because it adds tension to the reel while the fish is struggling but relaxes as you are trying to reel your catch in. Now, there are a couple of different mechanisms at work in the disc drag, depending on the style that you choose. If you are looking for a higher-end option that requires very little maintenance, you should consider a sealed disc drag system. For those that don’t mind getting their hands dirty, there is the unsealed disc drag. Regardless of which one you choose, though, you can be quite certain that you will be able to reel in bigger fish without much of an issue. What Arbor Is Right for You? The arbor is essentially the cylindrical object that can be found at the center of the reel. It is here that the fly line and backing are wound. The arbor you decide on will be determined by the species that you are looking for and sometimes, the environment that you are fishing in. This design isn’t used as often anymore, except by traditionalists. There is no doubt that the backing on the arbor isn’t up to standard. However, the main disadvantage is the narrow frame which requires coils of much smaller diameters. As a result, the rate of retrieval suffers and causes your line to have greater coil memory as well. The mid arbor design is an improvement on the standard arbor design. This is because in addition to being lighter, the frame on the arbor is wider which means that there is a greater retrieval rate and there isn’t nearly as much coil memory. To top it all off, it has a great backing capacity. As the name suggests, these arbors are considerably larger than the previous versions. Despite this, they are actually quite lightweight due to the way they have been constructed. Furthermore, the design of the arbor results in an incredibly fast rate of retrieval and there is excellent backing. Not to mention, the coil memory is lessened due to the width. In the end, it really is down to personal preference when it comes to choosing the arbor. For instance, if you are a beginner, you may actually feel more comfortable with a smaller arbor. Or, if you tend to fish in saltwater, you may find that a large arbor is more efficient for you. Reels are constructed in one of two ways – pre-cast or machined. The choice that you make really depends on how much you are willing to pay for your reels. Machined reels are clearly the superior option since they are well-designed and carved from an entire block of metal. This makes them lighter and stronger and will last for as long as you need them to. Furthermore, in addition to having a longer lifespan, these reels will continue to perform superbly. As you can imagine, all of this costs a pretty penny and may not be the best option for beginners. The pre-cast reels are made from a cast that has liquid metal poured into it. This means that the reels tend to be heavier although they do perform quite well. What can’t be guaranteed about these reels, though, is how long they will last. However, they don’t cost nearly as much as the machined reels. What was apparent almost right away with this reel was the value for money. Despite being a machined reel, it is quite affordable but it doesn’t skimp on the materials used or the workmanship at all. You can tell this from the drag system which is incredibly smooth regardless of the size of the fish that you are battling. Also, this reel features a roller bearing that makes sure that the drag action only takes place in one direction. The arbor design is very large which means that you get excellent backing with very little coil memory to boot. I have found this reel to be particularly handy in saltwater locations, again all thanks to the large arbor. The reel also boasts non-slip rubberized handle knobs. Now, this may not seem like a big deal until you are actually trying to reel in a catch. As the knob continues to hit you in the knuckles, you will be quite thankful for all that cushioning. While there is a lot that I like about this fly reel, I can’t claim that it’s perfect. My main complaint would be that it is as hardy as more expensive models. Of course, at this price point, it is to be expected. If, like me, you are quite hard on your fishing equipment and need one that is going to stand up to all of that abuse, you may want to turn to this reel. This is quite shocking considering the low cost of the reel. One of the things that really endeared me to this reel is that while you adjust the drag, you can hear a click. This makes it easier for you to get the perfect setting and have a much easier time while you are fishing. Now, speaking of the drag, it is quite smooth which makes reeling in even larger fish an absolute breeze. The design of the reel means that it only ever moves in one direction, regardless of hard the fish is struggling. The mid arbor has been beautifully machined so that you get a lightweight part that allows for an incredibly fast retrieval rate. This is all while minimizing the coil memory. Although it arrives with a left-hand retrieval, this can easily be changed by you. While this fishing reel does function incredibly well, I would say that it is a better option for beginners. 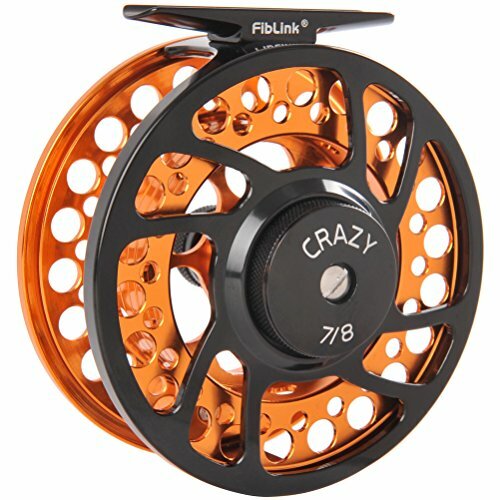 I would recommend this Croch fly reel to anyone who is only just beginning to dabble in fly fishing. Well, it is lightweight, costs very little, and has been built to be used in a variety of environments. This reel is very light for a reason – it is meant to perfectly balance the ultra-light reels that are typically found in today’s market. Still, the reel is made of high-quality aluminum and is quite strong. Since it has anti-corrosive properties, you will be able to use the reel in saltwater areas as well and not have it rust. Another standout quality of this reel is that the disc drag is quite smooth but more importantly, can be adjusted very easily. The reel comes apart very easily when you want it to, which makes maintenance an absolute breeze. The spool is also fairly wide which considerably increases your retrieval rate once you have a fish hooked. What I found a bit odd about this reel was the fact that it came with a right-hand retrieval, which is quite unusual among reels. However, this can be remedied easily enough thanks to the one-way bearing and there are also instructions provided. If you are in need of a backup reel or are just looking for one to get started with, then this is the reel for you. The good news is that while this fly reel is quite cheap, it offers up a great deal of quality. One of the things that I noticed as soon as I began setting up this reel is the drag settings. They are easy to manage and precise so that when you do cast your line, your drag is set up perfectly. The drag also gets points for being very smooth. The reeling action also deserves special mention. As the arbor is quite large, the retrieval rate is fantastic. Also, you don’t have to worry as much about coil memory. 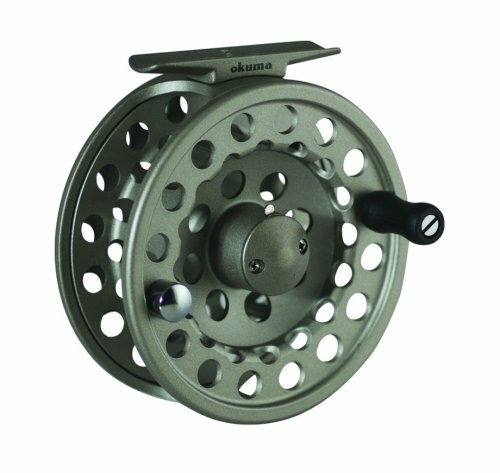 By trying these reels out with a bunch of different rods, I have found them to be most efficient with the lighter rods. The thing to remember about this reel is that it is die-cast. So, while it does work well for the moment, it is unlikely that it will continue to do so, particularly with heavy use. This is why it works better as a backup reel. The performance that I experienced with the Goture fly fishing reel was a pleasant surprise. Sure, for a machined reel you would expect a smoother action but at this price point, I wasn’t sure that it was what I was going to get. Well, this drag system is top-notch and along with the spool release system, it allows for retrieval to be a great deal easier. The drag is absolutely beautiful and continues to be smooth even when you have a fish that tries to break for it and swims out farther. It is quite lightweight which makes it a good match for the modern, lighter rods. 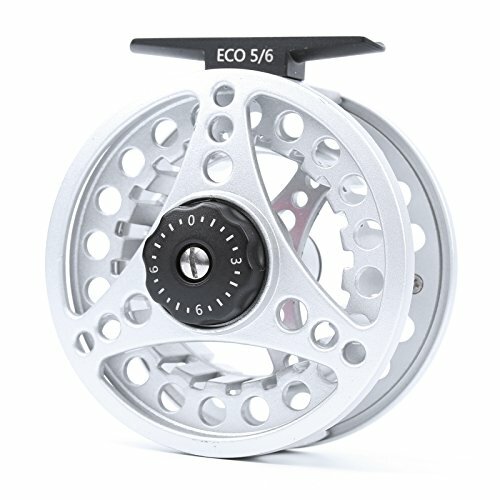 This reel is a good fit regardless of whether you are fishing in freshwater or saltwater. It’s got corrosion resistance that ensures the reel is going to continue to stay in top condition even if you don’t maintain it all that well. There isn’t all that much to complain about this reel, with the handle being the only point of contention. It is made entirely of aluminum which does make it more durable but also makes it a bit uncomfortable to use. The one thing that you can’t fault on this fly fishing reel is the finish. It is made from aluminum and boasts a CNC machined, cold forged construction. So, not only is the reel very light, it is also smooth and sleek. Considering how little you have to pay to get this kind of quality, the workmanship is really quite astonishing. Of course, what matters most is how well the reel functions. Here, too, it puts up a good show. This is the kind of reel that you want on hand if you are going to take on energetic fish that are going to try to swim away. There is very little resistance as you are trying to retrieve your line, which means that you can do so much more smoothly and a lot faster. The other thing that I noticed about this reel was how easy the retrieval switch is. It is certainly one of the simplest that I have encountered so far. Now, this is not a reel without its faults. While the arbor may be advertised as being large, it is a bit smaller than that. As such, there is some coil memory to contend with. 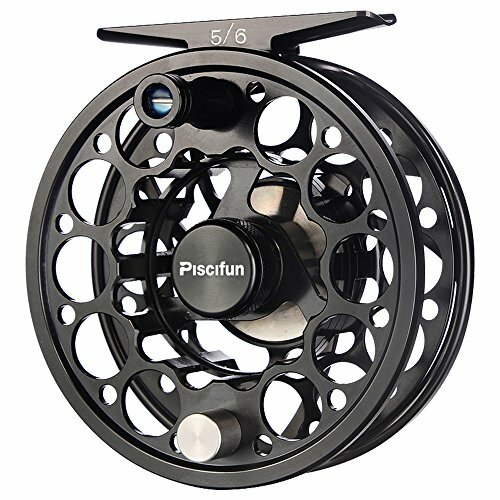 In this battle of the fly fishing reels, the Piscifun Sword Fly Fishing Reel comes out on top. Its low cost makes it a great option for everyone, although beginner fly anglers are bound to enjoy this the most. It is well-designed and lightweight, and has a good balance compared to the newer, lighter rods available on the market. The mid arbor allows you to get the best of both worlds – the good rate of retrieval and a lower than normal coil memory. Yet another advantage is the smooth drag although it is the drag settings that really set it apart. 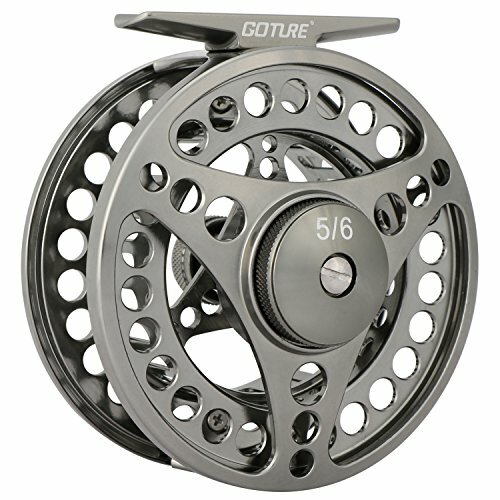 With this reel, you don’t have to guess your settings anymore as there is an audible click that you can hear and feel. It is all of these features that place it above the rest. This concludes your foray into fly fishing reels, where hopefully you have been able to find one that is perfect for you. If you have any questions at all, please drop it in comment and I will respond.